L 16″(41 cm) W 42″(107 cm). Most common call is “kewp kewp.” Most vocal during courtship displays. Description: Sexes similar. Gray above, white below. White head and tail. Shoulder area is black. 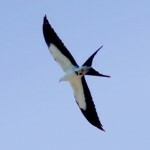 Black patches at bend of wings can be seen from below when in flight. 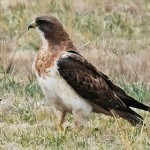 Immature is similar with rust-colored streaking on breast, and a brown back. 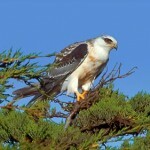 Conspicuous red eyes can be seen on adult when the bird is perched. Habitat: Open grasslands, wetlands, oak-woodlands, or savannah-like habitats. Requires trees for perching and nesting. Where in Nebraska: Casual vagrant. 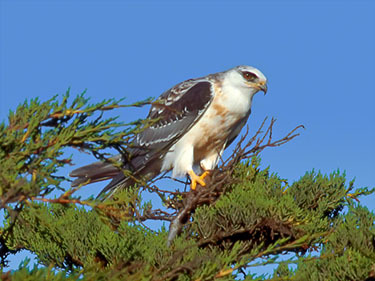 Fun Facts: During the nonbreeding season, the White-tailed Kite roosts communally, with more than 100 individuals.